Aintree University Hospital NHS Foundation Trust has replaced paper medical records with an electronic system that clinicians find as navigable than paper – more so, in some cases – and has done so six years ahead of the current health secretary’s "go paperless" edict. Aintree is a large teaching hospital in Liverpool providing Accident & Emergency services and a range of acute and non-acute specialties. It serves a population of around 330,000 in north Liverpool. The project won a Computer Weekly enterprise software user award last month. 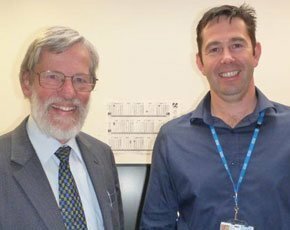 Ward Priestman (pictured, with Mike Pearson, left), director of informatics at Aintree University Hospital NHS Foundation Trust, says senior clinician involvement with the electronic document management system project was crucial. Priestman's role encompasses IT, information and performance. “If you don't have clinical engagement, you will fail. This is not an IT project, it is a business change project with an IT dimension,” says Priestman. The project has its origins in a proposal for a new building in 2008. It deployed bespoke software from CCube Solutions along with a custom portal to provide clinicians with an electronic medical record. Capita Total Document Solutions (TDS) is providing the service, using Kodak scanning hardware and software to ensure high-quality image capture. “All three have been fantastic”, says Priestman. In 2008 the trust was planning to construct a £45m building with three floors – two for clinical purposes and one for paper storage. “That meant up to£15m for storing paper. I said that was nonsense, you can’t do that,” says Priestman. He convinced the Aintree University Hospital NHS Foundation Trust board to invest in technology to get rid of the paper. There followed a 12-month scouting and tendering process. Priestman says: “We found the enterprise content management systems out there were not mature enough to do what we wanted them to do. “So we worked with a supplier and got them to make some changes, especially around forms recognition, which made it work in an NHS context. We quickly realised that our pre-printed forms had most of the information to make the indexing easier. “Imagine a patient coming in for 10 years with a chronic condition. That could mean six or seven volumes, with hundreds of pages. By using an electronic system you can find that information much faster. “So it started as a storage cost project, but it quickly moved on to the clinical piece. “We are a teaching hospital and many of our senior clinicians work from home. So they can now be consulted remotely by junior doctors and students.” Some 3,000 Aintree health professionals use the system on a daily basis and the trust has stopped using paper health records in clinical practice. Staff access the electronic document management system by means of the trust’s Patient Management System (PMS) when they login. Other IT systems are integrated, including pathology and radiology results, pharmacy, prescribing and theatre systems. A clinical team helped define the functionality of the software. Workshops were held so staff could engage with a prototype system and provide input. And so Aintree uses CCube’s bespoke forms recognition technology, including OCR, to automate the process of recognising the pre-printed forms. This ensures contents are correctly indexed even if forms are incorrectly filed in the physical records. “There is an NHS edict to be paperless by 2018. We did that by 2012. The system is very robust in terms of its architecture. And it is faster to find the information than in the old paper-based system," says Priestman. “You could take this project up and use it in any other NHS acute hospital in the country.” He confirms it is in use at St Helen’s and Knowsley. “The partners all played a huge part in what we did. If we did this again, we would not have started to scan ourselves in the first place. We gave it a go but was an absolute nightmare, and we tried everything. You'd also have to build up a team and then disband it. I would strongly advise outsourcing that risk," he says. The system cost £1.5m and the project took 15 months to complete. The trust expects to save £1m annually by closing the traditional paper library, reducing staff and avoiding the transport costs associated with moving 4,200 patient files every day.